These days, we all know someone with a peanut allergy, or have kids in school with classmates who cannot eat – or even touch – peanut products. Food allergies are on a lot of people’s minds and with good reason – food allergies can be deadly. Food allergies happen when our body’s immune system thinks a protein in that food is a threat. It will attack the protein, causing common symptoms such as swelling, itching and wheezing. The most common food allergens are wheat, eggs, fish, peanuts, milk, tree nuts, soy, and shellfish. According to the Academy of Nutrition and Dietetics, these eight account for 90 percent of food allergy reactions in the United States and about five percent of children are affected. Various studies have shown exclusive breast feeding for the first six months of a child’s life has a positive impact on preventing future food allergies. Experts not too long ago suggested keeping breast-fed babies from exposure to peanut protein, hoping to curb the rise in peanut allergies. Today, the thinking is exactly the opposite. The American Academy of Pediatrics recommends introducing solid foods, including peanut containing foods, between 4-6 months to help prevent allergies. If you suspect a child has a food allergy you should contact your pediatrician immediately, so allergy testing can be done. If a food allergy is confirmed, it is important to educate yourself and everyone who cares for your child. When eating out, be sure to plan ahead. Call the restaurant and ask how foods are prepared and if they can provide allergen-free meals. It is important not to eliminate an entire food group to make it easier to avoid allergens, as this could cause a deficit in important nutrients your child needs for growth and development. If you need help, consult a registered dietitian to help you plan meals and snacks that are healthy and safe. For great allergen-free recipes to enjoy this summer, visit tasteofhome.com. Here’s one for Patriotic Pops that will be welcome at any Fourth of July cookout! Place 2 tablespoons yogurt, 1 tablespoon honey and 1 cup strawberries in a blender; cover and process until blended. Remove to a small bowl. Chop remaining strawberries; stir into strawberry mixture. In blender, process 2 tablespoons yogurt, remaining honey and 1 cup blueberries until blended; remove to another bowl. Stir in remaining blueberries. 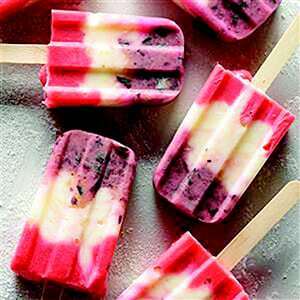 In each mold, layer 1 tablespoon strawberry mixture, 2 tablespoons yogurt and 1 tablespoon blueberry mixture. Top with holders. (If using paper cups, top with foil and insert sticks through the foil.) Freeze until firm. Yield: 1 dozen.